Anything goes for school fetes: small cakes that can be sold off individually to hungry kids or large cakes that mum can take home and serve for tea after a busy day helping at the school fete! See 'Cakes' in the 'Kids Cooking' section for other ideas but here are some to start. Preheat the oven to 180oC gas mark 4. Grease a baking tray. Add the flour, sugar, oats and coconut and mix well. Empty into the baking tray and press down. Cook for about 12-15 minutes until browned. Melt the chocolate and pour onto the base. Spread it out and allow to set. When cold, cut into slices. Tray bakes are ideal for this school fetes. You can make a basic sponge base and cover with a variety of toppings. Preheat the oven to 180oC, gas mark 4. Grease and line a roasting tin with greaseproof paper. Beat the margarine and sugar together until light and fluffy – an electric mixer is best for this. Add the eggs one at a time beating well with each addition. If the mixture starts to separate, add a little flour with the egg. Fold in the remaining flour. Pour the mixture into the tin and level the surface. Bake for 15-20 minutes, until well-risen and golden, and coming away from the sides of the tin. If you have a food processor, you can make this cake by the all-in-one method, adding 2 teaspoons baking powder. Turn the cake out of the tin and allow to cool on a wire rack. Spread seedless raspberry jam over the top of the cake and sprinkle with desiccated coconut. Cut into individual small cakes. 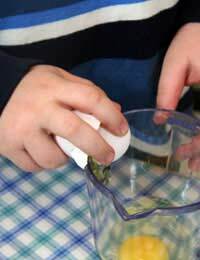 Make a 'thinnish' icing with sieved icing sugar and lemon juice or milk and vanilla essence. Pour over the cake and cut into pieces. Top each piece with a chocolate button, piece of chocolate flake, glace cherry or Smartie. Make chocolate butter icing by beating together 3 oz butter, 6 oz sifted icing sugar, 1 oz melted chocolate and 1 tablespoon milk. Spread over cake and decorate with Smarties. Preheat the oven to 150oC, gas mark 2. Grease and line an 8” round cake tin.Mix all the ingredients - except the chocolate chips - in the order listed and pour into the tin. Bake for 1½ hours or until well-risen and springing back when pressed.Sprinkle with the chocolate chips and leave to cool in the tin. Preheat the oven to 180oC, gas mark 4. Grease a 7” loose-bottomed tin. Cream the margarine, sugar and grated lemon rind together. Stir in the flour. Beat together the eggs and milk and add to the mixture. Stir well. Place in the tin and bake for about 50-55 minutes or until well-risen and golden. While the cake is cooking, make the syrup. Dissolve the icing sugar in the juice of the lemon.When the cake is cooked, remove from the oven and pierce all over with a skewer. Carefully pour the syrup over the cake and leave it in the tin to cool.